Even though that country is 8,929 miles away, the effects of the massacre in New Zealand are still being strongly felt in New York City. Students, neighbors, and community centers have been holding vigils this past week for the 50 victims of the New Zealand shooting that took the lives of Muslims inside two mosques. 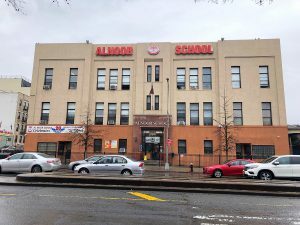 Communities and neighborhoods all across Brooklyn have been on edge, many with the same questions in mind: What if something awful happens here? What if we were New Zealand? The president of the Arab-American Federation, Zein Rimawi, said that he, like so many others, was deeply pained when he heard what happened in Christchurch, New Zealand. The bonding with the pain experienced by New Zealanders is evident throughout New York City, a place of so many faiths. In Brooklyn there are special emotional ties. 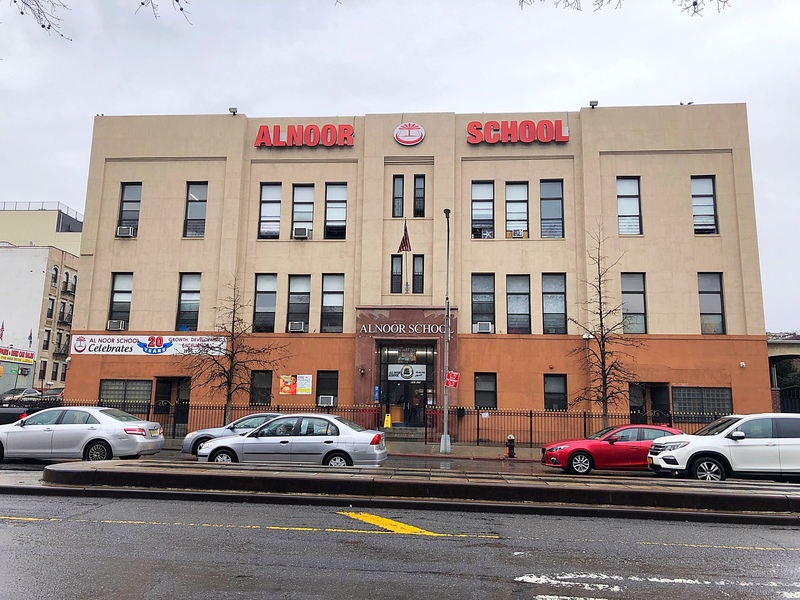 There is, in fact, a Muslim school in Sunset Park, Brooklyn, named Al Noor, the very name of one of the mosques attacked by the acknowledged white supremacist. After the mass shooting, the New York City Police Department increased its patrolling around the city. During Friday prayer services, there are patrol cars standing outside various mosques throughout the city. “To the Muslim community here in New York, we stand with you always, and we will remain vigilant in keeping you safe—and making sure you feel safe, too,” Police Commissioner James O’Neill said in a statement after the killings. “We are connecting with area mosques and Muslim community leaders, and increasing patrols and high-visibility counterterrorism presence at locations around the city,” he continued. There are mosques that have hired or are thinking of hiring armed guards to stay during Friday prayers, Rimawi said, though he added that he believes the danger of hate attacks remains. Community organizer and co-founder of the Pakistani American Youth Society, Kashif Hussain, spoke about how it does not matter if the attack took place over eight thousand miles away. He said Brooklyn and Christchurch have many things in common: Both are diverse, both offer freedom and refuge. He said that despite feeling helpless, everyone is hopeful. “Love will always prevail over hate,” he said. 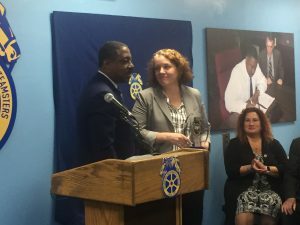 Teamsters Local 237 on Thursday held its first Marie Colvin Awards ceremony at the union’s building in Manhattan. Marie Covin was an American war correspondent who was killed while reporting on the Syrian civil war in 2012. Colvin worked briefly for the Teamsters Local 237, before she started her journalism career at United Press International, a year after graduating from Yale. The Marie Colvin Award was created to honor courageous women from New York like Marie, who make a difference in the world. women working in other city agencies. The emotional tone of the reunion got the guests to give a round of applause to McDermott. Cathleen Colvin, Marie’s sister, received the award from Teamsters Local 237 president Floyd. Among the political figures attending the event were Manhattan Borough President Gale Brewer, New York State Lieutenant Governor Kathy Hochul, New York City Comptroller Scott Stinger, and National Organization for Women’s President Sonia Osorio. 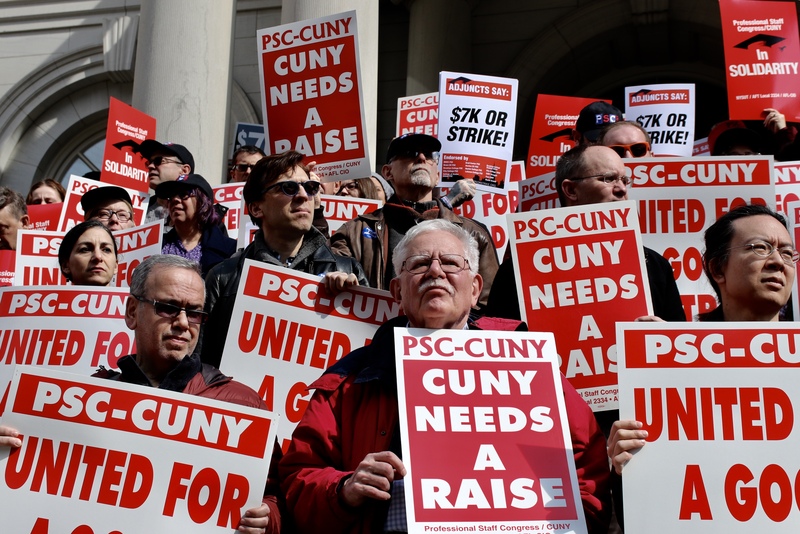 Dozens of CUNY professors, staff members and students rallied on the steps of City Hall Thursday afternoon to demand a new contract and a living wage for adjuncts. Currently, adjunct professors receive less than $3,000 per course, resulting in about $26,000 a year. They are demanding at least $7,000 per course. 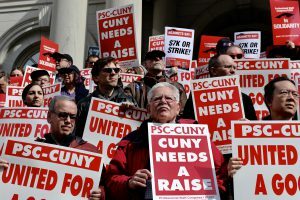 The executive director of DC37, New York City’s largest municipal public employee union, Henry Garrido, showed his support and said this fight was an important one, especially since he is a product of CUNY. At the end of the press conference, everyone walked around in a circle chanting and demanding a better contract. He also spoke in awe of students who are supporting professors. 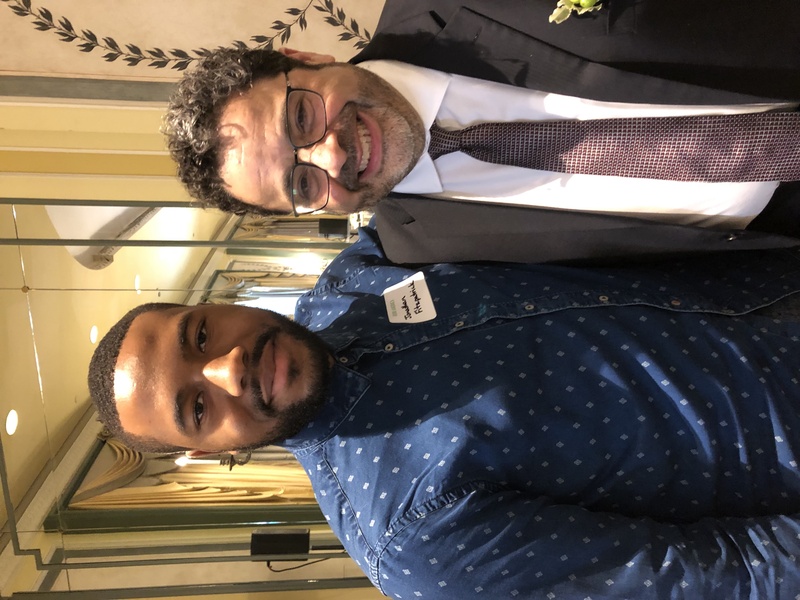 Former Brooklyn College professor Arturo O’Farrill was one of the latest inductees to the Irish American Hall of Fame. He was a professor in the Conservatory of Music and the founding director of the Global Jazz Studies Program. In O’Farrill acknowledged a certain disconnect or irony in his induction. “I’m known for something that’s not Irish-American – Afro-Cuban Jazz,” he said in his acceptance speech. 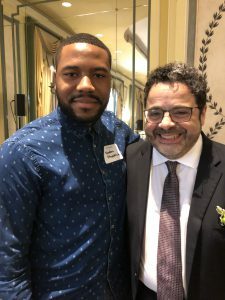 Jonathan Wilson and Arturo O’Farrill. That last remark was in reference to his family’s background in Cuba. The O’Farrill family settled in Cuba in the 1700s, according to O’Farrill, and his ancestors became businessmen and lawyers. O’Farrill described himself and his father, who was a well-known musician and was nicknamed Chico, as the black sheep of the family, because of the mark they made in the music arts. O’Farrill conceded he showed himself to be very much unlike his ancestors, who built homes and hotels throughout Cuba’s capital city of Havana. That last statement of O’Farrill’s echoed in the words of his speech, and also in the soul of the music he played at Thursday’s ceremony. On Thursday, a dozen people gathered outside New York Criminal Court in Manhattan to protest the inaction of District Attorney Cy Vance toward reform of the criminal justice system. 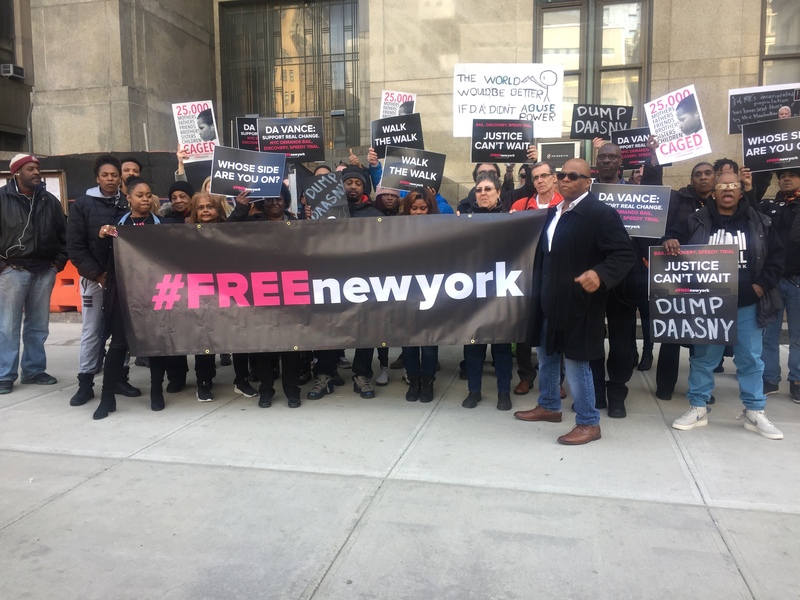 Representatives from the #FREEnewyork campaign, a state-wide effort to end the jail crisis in New York, as well as JustLeadershipUSA, stood with banners to demand Vance leave the District Attorneys Association of New York (DAASNY). Protesters believe that the DAASNY uses fear rather than facts to block progressive reforms to the criminal justice system. They maintained the DA should use his powers for the good of all his constituents, especially those who are directly impacted. “People languishing in jail at Rikers Island waiting for their trials, are being abused. They get mentally and physically abused by the system!” shouted a woman standing behind a #FREEnewyork banner. The activists entered the court building, took the elevator to the 7th floor, and delivered their letter to the office of the District Attorney. They shouted, “Free New York!” as the clerk there listened to them with an air of impatience. The Open Society Foundations hosted an event discussing the causes of and solutions for drug overdoses in the United States. According to Open Societys, the crisis is the leading cause of death among Americans under the age of 50. “The Real Causes of (and Solutions to) Drug Use and Addiction” discussion took place at the host’s New York office, located on West 57th St. and Broadway. The discussion was led by Johann Hari, New York Times best-selling author of “Chasing the Scream”’ Jasmine Tyler, advocacy director for the U.S. Program at Human Rights Watch; and Matt Wilson, deputy director of the Open Society Global Drug Policy Program. Wilson moderated the conversation. Hari is a former drug addict who decided to write books about his personal experiences. “No Veteran is ever turned away,” said Loree Sutton, chair of New York City’s Department of Veteran Services (DVS,) during a budget hearing Thursday at City Hall. The budget in question totaled $5.2 million. The hearing was conducted by the City Council’s Committee on Veterans. Sutton and DVS are trying to surge toward in their efforts to better life for military veterans living in New York City. DVS was formed in 2016 and now gives services to more than 200,000 veterans. “Veterans are our north star,” Sutton said. During the hearing, some of the topics dealt with were need for housing, job vacancies at DVS, the needs of LGBTQ vets, and suicide as a big concern among veterans. According to Sutton, there has been a 90 percent increase in the number of veterans getting accepted into NYCHA, housing since DVS was started in 2016. LGBTQ veterans have been a hot topic recently. Some LGBTQ veterans around the country have been discharged and haven’t been able to get the resources they need when coming back from service and transitioning back into civilian life. Sutton assured the committee that regardless of sexual orientation or gender, DVS will work with veterans to give them the help they need. Testimony at the hearing showed that DVS spent on $3.6 million of the $4.4 million it has been allotted in the 2018 budget. Department Commissioner Jeff Roth said this was because there was a shortage of employees. Out of the 47 full-time positions, only 36 are filled. DVS told the committee they are going through interviews to try to fill those positions and get the spending back to where it should be. Regarding suicide, DVS indicated it was not sure how many veterans commit suicide on a yearly basis but said they are “actively working” on getting that number as well as creating a plan to combat veteran suicide. There will be another hearing where the budget will be officially announced. That hearing has no date currently. The New York City Fire Department (FDNY) and the city Board of Standards and Appeals (BSA) are proposing to eliminate outdated fire safety requirements. The Board of Standards and Appeals was once responsible for fire safety regulations (fire escapes, sprinkler systems, doors, etc.). The New York City Department of Buildings took over the role of the BSA, after the enactment of the 1968 Building Code. Officials of the FDNY gathered Thursday with counterparts at BSA to simplify rules having to do with building safety. “This is like a big clean up,” FDNY Legal Counsel Julian Basil told The Brooklyn News Service. He noted that in the city “more and more regulations and laws (are) being enacted.” But he said with obvious delight that there are “times that people actually go back and clean up old stuff.” Times like now. However, there were not many attendees at Thursday’s hearing and it barely lasted a minute. The Brooklyn News Service was the only media outlet present. New York State Supreme Court Judge Schlomo Hagler warned MTA of its obligation to make the subway system accessible for all, during a hearing this Thursday. “I give you one last opportunity to resolve your differences and put the money where it is necessary,” Judge Hagler stated to the MTA attorneys. The lawsuit was filed against the MTA in 2017 by a group of disability organizers and disabled residents who say that the New York City subway is one of the least accessible public transit systems in the nation. Hagler said that he has given the two parties more than enough opportunities to reach a settlement on the matter. 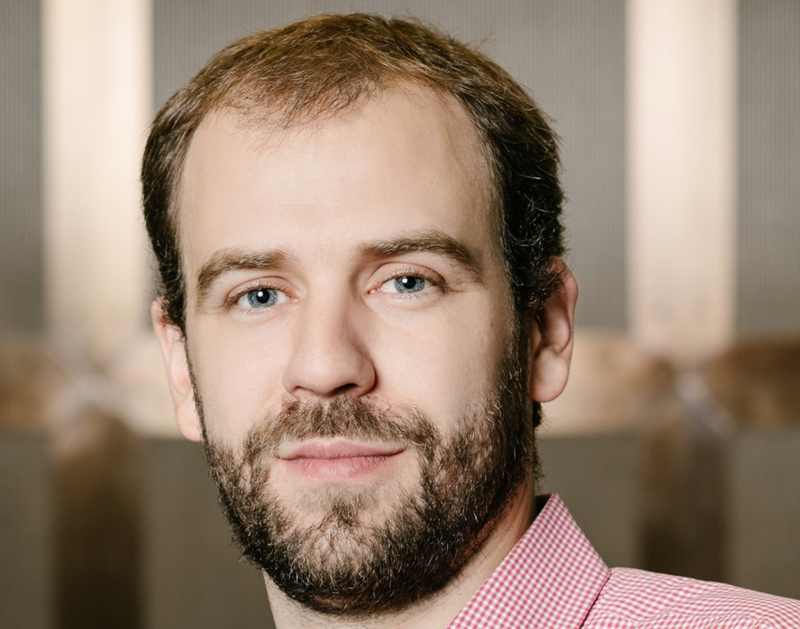 “It’s just plain the right thing to do, to get everyone on board literally, on our trains, our busses, our transportation system,” Hagler said. The judge made it clear that he plans to end the ongoing case at the next court date. In May 2018, New York City Transit President Andy Byford launched Fast Forward, a plan improve the subway system and make each station fully accessible. This would include installing elevators at most of the 472 station around the city. “It hasn’t been funded so at this point, it’s just an empty promise,” said Maia Goodell, attorney with the Disability Rights Advocates, who is representing the disability organizers pursuing the suit. Goodell added that the parties have been trying to settle the suit for over a year and she is looking forward to a decision from Judge Hagler. Ahead of the hearing, a coalition of several disability rights activism groups gathered for a rally in front of the Supreme Court building to call attention to this pressing issue. “We are here today to share a pretty simple message; elevators are for everyone,” said Sasha Blair-Goldensohn, a disability rights activist with the Elevator Action Group and with the direct action group, Rise and Resist. 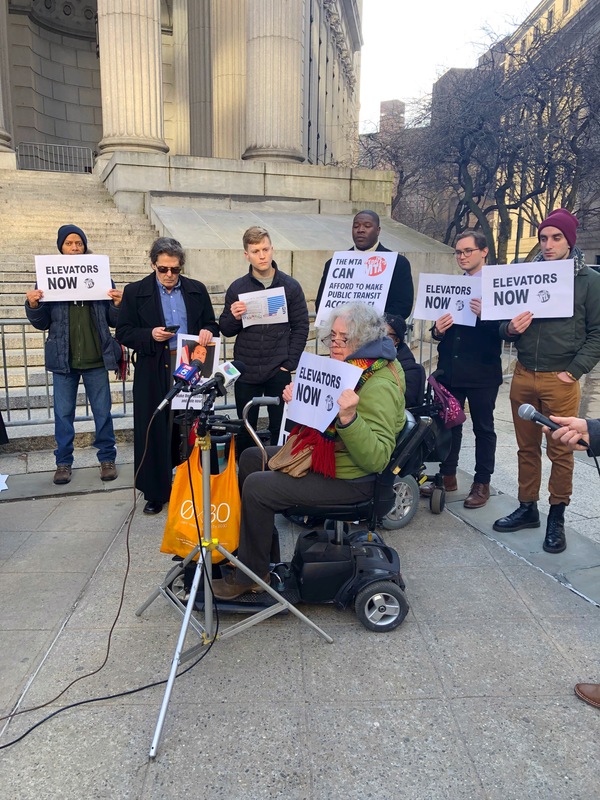 “The MTA lawyers, under the direction of Governor Cuomo have been evading their responsibility to build an accessible system for everybody,” Blair- Goldensohn added. Among those rallying were NY State Assembly candidate Chiedu “Shea” Uzoigwe, of Queens, who said that change can come. “We want to make sure that we are providing MTA with the funding they need to complete this ten-year plan. Right now the way to do that is by implementing congestion pricing to provide a dedicated stream of funding,” Uzoigwe said in an interview. Uzoigwe is striving to be elected to represent the district 31 in Queens. The president of Disabled in Action of Metropolitan NY, Jean Ryan, said that she hasn’t been able to ride the subway in over 25 years due to the lack of accessibility. Ryan, like many other disabled New Yorkers, relies on Access-A-Ride to move about the city. “It’s so difficult to use Access-A-Ride. The last one that I took arrived over an hour late,” Ryan said. Ryan said that in addition the lateness, Access-A-Ride usually takes routes that tend to make the ride much longer than necessary. Activist Jennifer Van Dyck urged the MTA to enforce a strict timeline for the Fast Forward plan. “We are all first-class citizens and we deserve a first-class public transportation system. What we have now is subway system that is inaccessible and intolerable,” Van Dyck declared during the rally. The need for more accessible NYC subways made national news after the January death of Malaysia Goodson. The young mother took a fatal fall while carrying her daughter in a stroller down the steps of a Manhattan station with no elevator. “Her death was avoidable,” says Christine Coleman, who is due to deliver her first child next month. “It really concerns me and it really highlighted that the subway is not safe.” Coleman is a resident of Long Island City and said that she will have great difficulty taking the subway with a small baby. The next court date is set for May 7. 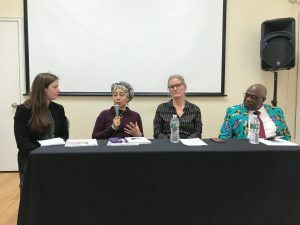 On Thursday, Interchurch Medical Assistance (IMA World Health) and Lutheran World Relief hosted a panel in Manhattan to address the response of religious institutions to sexual and domestic violence. Three specialists discussed the ongoing problem of poor response from religious institutions in regards to sexual assault and domestic violence. In an independent study, conducted by IMA and LifeWay research, a faith-based research company that monitors church culture, it was discovered that out of 1,000 pastors who were interviewed, 90 percent have had to deal with a case of sexual assault or abuse in their congregation. However, only 50 percent felt adequately trained to handle such problems. The call for better response from religious institutions comes at a time when the public is questioning beliefs more than ever. In a recent poll conducted by Gallup (and released on Wednesday), 37 percent of Catholics question their affiliation with their church. This is the highest percentage since the Boston Globe broke the news of widespread abuse by priests in the greater Boston area. The poll comes one month after two of Virginia’s dioceses released the names of 58 clergy officials deemed “credibly accused” of sexually assaulting youth. 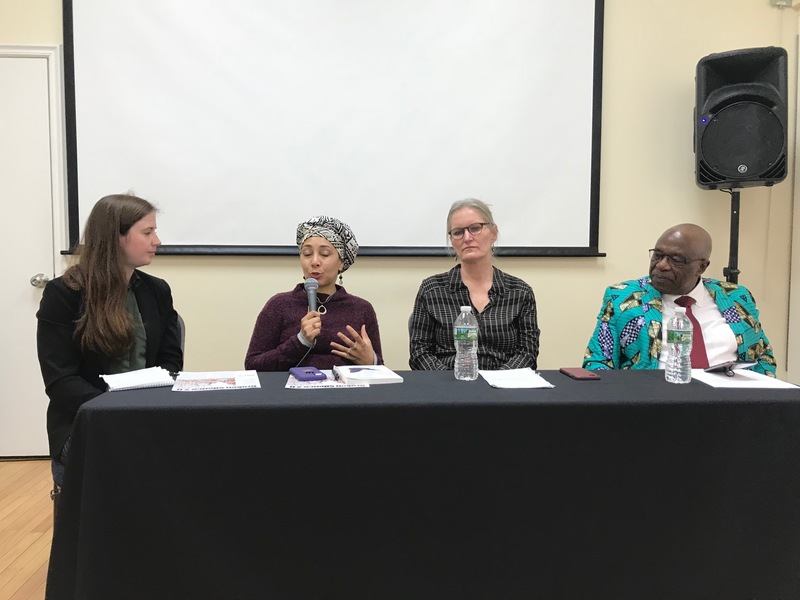 Not only did the panel discuss practical training methods for clergy, but they also discussed scripture and how it can be used to curb sexual violence. Thursday’s Conference was a step in the right direction.